Readers' Choice Products of the Year Winner! 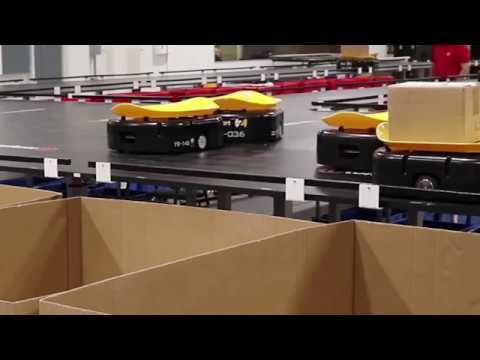 Tompkins International introduces Tompkins Robotics, a revolutionary unit and parcel sortation system that has been patented for North America and Europe. Tompkins Robotics has developed and introduced the world’s first, portable automated sortation system, named t-Sort. This new and innovative robotic technology will help build world-class supply chains, providing unmatched flexibility and throughput. Our designs can accomplish volumes ranging from millions of units a day to a small operation in the backroom of a supercenter or mall anchor store. Watch our video in the link immediately below and learn more about the features, applications, flexibility, and unique capabilities of the t-Sort system. The Tompkins Robotics leadership team includes some of the best minds in the industry. Our experts have decades of hands-on experience and a wealth of knowledge to help our clients succeed. Click on each leader’s photo to learn more. Denny McKnight, an expert in global distribution strategy, has spent his 30 year career focusing on warehouse logistics, equipment, and technology, as well as overseeing the development of Tompkins’ proprietary robotic sortation systems and strategic partnerships. McKnight’s role as CEO of Tompkins Robotics has included involvement from the beginning, and he was instrumental in bringing the technology to market. He works with the leadership to develop and further partnerships, channels, markets, and applications for the t-Sort system and other, complimentary systems. McKnight’s extensive experience leading large-scale initiatives in facility re-engineering and new greenfield DC/FC design has given him unrivaled levels of insight into the best approaches and technologies for the modern distribution and fulfillment environment. 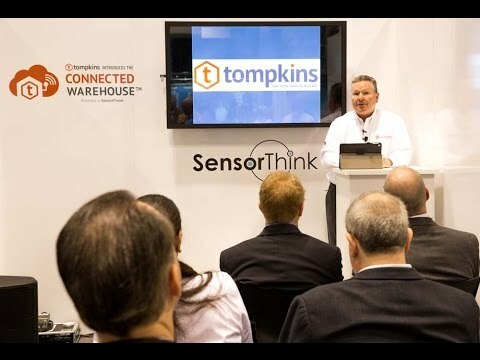 As President of the Tompkins organization, he has been instrumental in creating the company’s vision of The Connected Warehouse®, where IoT-enabled equipment and building control systems harmonize with next-generation WES technology to create new levels of efficiency and supply chain transparency. McKnight is a frequent speaker on various warehousing and logistics subjects, is quoted in top industry publications, and has contributed to several industry related books. In 2018, he was recognized by Supply & Demand Chain Executive as an industry “Pro - to - Know”. Mike is the President and one of the original leaders that has created Tompkins Robotics and brought the t-Sort sortation system to life for global customers. t-Sort is the world's first robotic, truly scalable, portable, and intelligently adaptable automated sortation system that is changing the way firms execute in their supply chains. He has been involved from day one in the evolution of this unique and innovation system - recognizing the potential, designing the applications, and creating the value proposition for Tompkins Robotics' customers. He continues to lead the design and forward movement of the company. He drives much of the new application development, new product conceptualization, and the integration with partners solving unique problems with complimentary robotic automation. His focus is to deliver Tompkins Robotics and its systems to customers in North America and Europe to maximize their service, performance, and operations in ways never before thought possible. Mike spent his prior career doing supply chain consulting and implementations for customers in a range of industries, including Pharmaceutical, Retail, Food & Beverage, and Consumer Products. Mike has been highly successful in building long-term relationships based upon his personal involvement in successful implementations. He has achieved significant results for clients that have led to bottom line savings, higher levels of performance, enhanced service levels across the supply chain, and an increase in overall shareholder value. He now brings that same level of success to the leadership of Tompkins Robotics and its customers. His client list includes over 200 hundred firms during his prior career and at Tompkins Robotics. Mike's work history includes the US Air Force, Tompkins International, Garr Consulting and Deloitte Consulting, prior to becoming totally focused on Tompkins Robotics. Bruce Baring is a Vice President with Tompkins Robotics and works with our clients to define requirements, develop solutions, and establish the business case for deploying our t-Sort solutions. t-Sort is the world's first robotic, truly scalable, portable, and intelligently adaptable automated sortation system that is changing the way firms execute in their supply chains. In the role of concept development, Baring brings a practical approach to creating the most flexible automated solution tailored to addressing our clients’ business needs as they evolve and grow to maximize their return on invested capital. Baring began his supply chain consulting career with Tompkins in 1995 and has recently joined the Tompkins Robotics team after working for several other consulting and engineering firms. Throughout his career, Baring has helped companies across all industry verticals transform and improve their supply chain performance through network optimization, distribution center design, and the deployment of automated solutions. Baring has a BSIE in Industrial Engineering from Texas A&M University and an MBA for UNC-Greensboro. Thompson Brockmann is an instrumental Tompkins Robotics team member. Since joining Tompkins International in 1995, Brockmann has developed extensive experience in the design and implementation of distribution networks and fulfillment centers in eCommerce, 3PL, consumer goods, retail, and apparel. He has played lead roles in developing strategic master plans, justifying systems and equipment, detailed facility planning and specification, and managing the implementation process for clients. In Brockmann’s current role as Vice President at Tompkins Robotics, he oversees the full life cycle, from solutions development post go-live owner transition of t-Sort, integrated material handling systems, and other automated solutions. Brockmann uses his over 20 years of experience in distribution and fulfillment system designs and implementation to deliver his clients with Tompkins Robotics solutions that maximize their service, performance, and operations in ways never before thought possible. Brockmann received his B.S. and Master’s in Industrial Engineering from North Carolina State University. Jim Serstad, Vice President of Product Development ensures that Tompkins Robotics is always on the leading edge of warehouse robotics. He is responsible for developing the mechanical, electrical, and software elements of the t-Sort system. Through several partnerships that Serstad developed with key robotics and material handling technologies, t-Sort integrates with upstream and downstream warehouse processes. He leads the internal efforts to take concepts from the drawing board to reality including the detail design, engineering, prototyping, testing, and finally the product commercialization, stabilization, certification, introduction, and refinement in the marketplace. He also oversees the writing and management of the many patents and patents pending that are held by Tompkins Robotics both in the US and globally. Prior to joining Tompkins, Serstad managed the acquisition of a Flextronics factory, and subsequently was responsible for operations and business development. Upon joining Tompkins, he drove the expansion of the firm’s Asia practice into warehouse design and material handling equipment. During Serstad’s 15-year tenure in China, his team discovered a ground-breaking sortation technology. In 2016, he moved back to the US to help introduce this sorting technology to the US. Serstad has a BS in Electrical Engineering and an MBA, both from Purdue University. The t-Sort system performs much like a tilt tray or crossbelt sorter. However, the unique and exciting difference is it uses free moving, independent robots. This is the equivalent of having a tilt tray with no track allowing each robot to travel to any divert or induction station independently along the shortest path. This greatly enhances efficiency to maximize your operational capabilities. Robots, chutes, and induction stations can be added modularly at any time with no interruption or downtime. An additional robot can be added in seconds to increase capacity. A unique feature is that the system can be purchased on a seasonal or annual basis deferring the capital investment and fully utilizing the asset at all times. This is unlike a traditional sortation system that one buys for their long-term growth plan, purchasing excess capacity that may be underutilized for years. A typical installation takes only four to six months to go-live. A truly game changing aspect is the system is completely portable and can be relocated to a different space over a weekend. Efficiency – Robots move along the most direct path. Space utilization – Typically ≤25% of traditional sortation space. 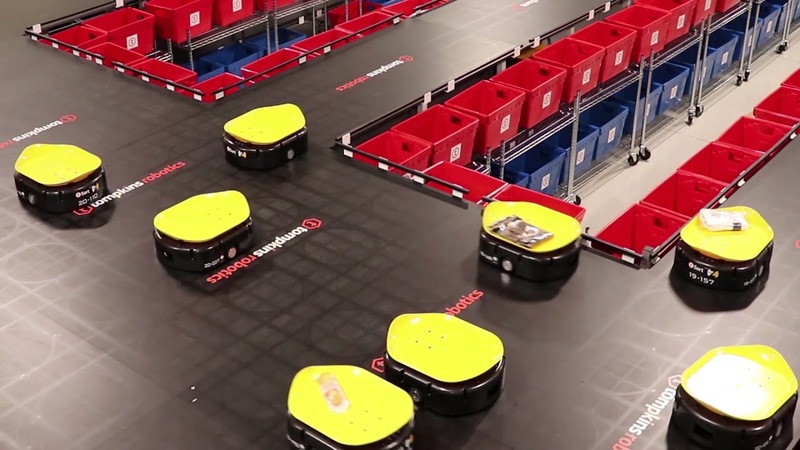 Modular – Robots can be added during peak season to increase throughput. System expanded at any time. Robots are less expensive – 40% to 50% less than a traditional tilt tray or crossbelt system. Capacity – System is typically multi-level and provides a ≥2 factor for volume, sort points, and capacity in a single footprint. Invest as needed – System is purchased and installed as needed each year or growth milestone. Postpones capital investment and allows full utilization of asset. Faster startups – Implementation is four to six months compared to a typical lead time of 10 to 14 months. Higher ROI – Lower investment, shorter lead times, faster implementation, reduced space, lower headcount, and incremental expansion/capital expenditures – all drive greater than 2X increase in ROI. Redundancy & Risk Mitigation – No single point of failure anywhere in the system. The system has mirrored servers, redundant infrastructure, and an uninterruptable power supply backup. Wide Range of Unit Handling – The type of unit loads t-Sort can process is much broader than traditional sortation systems. This includes apparel, shoe boxes, general merchandise, shipping bags, and small-to-medium boxes. t-Sort offers multiple tray designs, optimized for different products, that can be easily changed. t-Sort can handle anything traditional unit sorters process and more. Cylindrical, round, extremely light, liquids, static prone, and other difficult items for tilt tray, crossbelt, and bomb bay sorters can be sorted by t-Sort. Designs sorting glass containers and other fragile, breakable items have also been implemented. t-Sort can sort individual items with varying speed and / or angle of divert based on the product characteristics or handling requirements. As the item is loaded, the system recognizes the item and the required sort method to optimally sort the item. This unique capability is not available in typical systems in use today. The items found in a retail store can be sorted in a special store-based mode for Buy Online Pickup In Store and local eCommerce orders. Most items for grocery and retail merchandise are sortable with t-Sort. 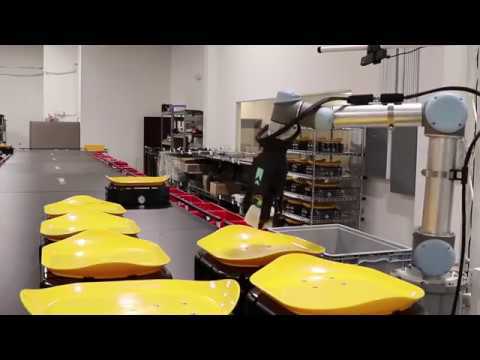 Wide Range of Sortation Destination – As each robot makes a complete stop at the sort destination, its tilt angle and speed can be configured to the individual product. t-Sort provides a positive and accurate sort to a variety of destinations including shipping cartons, totes, gravity conveyor lines, chutes, bags, and gaylords. Further, the destination receptacle/accumulation device and system configuration can be customized to the client’s solution to ensure the design best fits the application. Ease of Configuration and Expansion – All components are modular allowing the system to grow and increase its operational functionality as needed. This includes easily expanding the number of robots, sort points, increasing the induction stations, and reconfiguring the system size, shape, and sort functions. The standard system operates on two levels and allows sortation of a wide variety of goods. Overall the system can handle items as small as a penny, up to 40 inches long by 30 inches wide, and weights up to 66 pounds. This is accomplished through the use of two different size and capacity vehicle designs with both tilt trays and crossbelt divert devices. Unique designs allow two items to be sorted in one trip that are destined for separate orders through dual tray and crossbelt designs. The system is ideally suited to handle apparel and footwear, general merchandise, single items, and innerpacks. Parcels sorted include bags, boxes, and mailers. Given the unique flexibility of this application, multiple implementation concepts have been developed, with multiple, large scale national customers implemented in 2018 and many more scheduled for 2019.
eCommerce Fulfillment – Wide range of product handling capabilities. Facilitates a large, single batch pick of high SKU operations allowing greater pick productivity than a put wall operation. Provides sortation to an individual order as opposed to a batch of orders sorted to a single location – less handling after sortation than current unit sorters. Provides a superior unit sortation process compared to traditional fixed track systems. Retail Location Backroom Design – World’s first portable, modular, automated system for items and parcels. Facilitates inbound sortation to aisles. Enhances eCommerce order processing by allowing store batch picking by department and automated, accurate, and efficient order consolidation. Facilitates Buy Online Pickup In Store in the same manner as eCommerce to allow fast processing, less labor, and less store aisle congestion. Automates order consolidation for the above processes, increasing customer service levels and lowering labor content. System can also sort parcels to route to originating post offices for local eCommerce shipments, allowing next day delivery at the lowest cost. Parcel Sortation – t-Sort provides a flexible and expandable parcel sortation solution that can handle mailers bags and cartons on the same system, diverting into a wide range of receptacles. Items can be sorted direct to postal bags, various size gaylords, or accumulation lanes for palletizing. Returns/Inbound Sortation – t-Sort is highly effective for returns sortation and loose item sortation/consolidation in receiving. The same range of items can be handled in a returns process as discussed for outbound order operations. Sortation can be to the SKU, vendor, or other defined levels for a given client. Large DC/FC – Up to 750,000 units a day in a single system and multiple systems can be integrated in a single facility. Hundreds to thousands of sort locations can be in a single system. Systems can combine eCommerce, store replenishment, returns, and other flows in a site to maximize leverage of the installation. Small DC/FC – Allows automation across a customer base never before tapped. Cost, modularity, phased installation, savings, and performance allow smaller companies and operations to benefit. Labor, accuracy, speed, and other key metrics can be improved at an initial cost not previously available to a small to medium DC. A client can start with a small system and grow it each year through expansion. The system grows as you grow. Supplement Existing Sites – Allows a small system to be added to a site, which acts like an automated large put wall. Saves labor, money, and capital with a large capacity increase with minimal impact to existing operations. The system can be expanded annually to facilitate future growth at a lower capital and operating cost. The t-Sort system is powered by Tompkins Warehouse Execution System (Tompkins WES), which eases the implementation through its quickly configurable design and is highly flexible with the ability to interface with a variety of host systems. Tompkins WES is cloud based to minimize IT hardware requirements, providing a large number of standard reports and analytics that will assist any operation in maximizing the benefit of the Tompkins WES system. Tompkins Robotics, combined with Tompkins WES, will help further evolve supply chain logistics automation, improving the efficiency of logistics operations. t-Sort is an effective means of automated order fulfillment for units to complete an order and automating parcel shipping operations. All of which, allow for better flow of goods, labor productivity, operations planning, implementation, use of capital, space, operating expense, and ultimately, customer service. Watch the Tompkins Robotics video to further understand the capabilities of the t-Sort automated sortation system. There is a tremendous reduction in capital cost and space in the warehouse for the t-Sort design, compared to a traditional automated sortation system. In conclusion, lower and delayed investment, shorter lead times, faster implementation, reduced space and labor, all drive greater economic justification and ROI. In addition, the system has unheard of flexibility compared to the systems in use today and is truly a game changer. Grocery Retailers Are Embracing Micro-Fulfillment -- But Is That Enough? Retail has evolved. To succeed, top retailers must master the demands of omnichannel fulfillment. For supply chain executives, this means selectively adopting emerging technologies, rapidly developing urban fulfillment processes, and actively building strategic relationships with logistics service providers. Home Delivery World has been dedicated to driving the evolution of eCommerce logistics by bringing shippers and solution providers together under one roof for the past 7 years. It is the most comprehensive event in the country that covers the entire delivery cycle from warehousing to the customer's doorstep. 2,500+ retailers, grocers and logistics providers will gather to discuss evolutions in the last mile & supply chain and we look forward to seeing you there! What are the Benefits of MonarchFx? How Can Robotic Automation Help Alleviate Labor Shortages?